KJIPUKTUK (Halifax) – This morning Tim Blades, anti-poverty advocate, member of BRAG and CASAR, and NS Advocate author, spoke truth to power about the Community Services’ Employment Support and Income Assistance program, better known as welfare or income assistance. Tim did so at Law Amendments, while the Financial Measures Act (this year’s budget) was under the microscope. And oh boy, did he ever tell them a thing or two! Hello everyone. Thank you for having me here today. My name is Tim Blades, I am an Income Assistance recipient, and I am here speaking on behalf of BRAG, the Benefits Reform Action Group. BRAG is a group of recipients and community advocates fighting for a dignified life for Employment Support and Income Assistance (ESIA) recipients, and changes to the ESIA program, in Nova Scotia. I would like to talk to you a bit about life on the system, and express some feelings about how the current ESIA transformation has been going. In March of 2016, I attended what was called a First Voice consultation. This was part of a series of public consultations put on by the Department of Community Services. The conversation was lively. People were speaking openly about not having enough money, too much paperwork, paperwork being lost at a DCS office, caseworkers being hard to contact, rude caseworkers, not having enough food. It’s hard to feed yourself when some recipients have as little as $27 left for the month after paying bills. It’s little wonder that 50% of all Feed Nova Scotia clients are income assistance recipients. Some people even had some positive things to say, how they had a caseworker that really tried to help. I was buoyed by the open conversation, and the presence of the Executive Director of the ESIA program, Mr Brandon Grant. I felt that maybe the Department of Community Services was finally listening, and that proper help was finally coming to Nova Scotians who so desperately need it. I stand here today, to let you all know, that I no longer have that optimism. This current welfare transformation has promised many things for recipients, including having basic needs met, better control over your life, social inclusion, better help with employment, better safety and security, and better implementation of services. As for Basic Needs, recipients only receive funds for a phone if they have a note from their doctor, stating that they have a medical need. This is ridiculous because how is a recipient supposed to be in contact with their caseworker or anyone else if they don’t have a phone? One could also argue that a phone is necessary for social inclusion, to be in contact with family or friends. A phone is currently classified as a “special need”, and will continue to be classified as such even with the ESIA transformation. On the topic of social inclusion, let’s talk about the new annual bus passes. I think we can agree that transportation is a basic need, not a medical need or a “special need”. Previously, transportation expenses were typically $20 for a sheet of bus tickets, or $78 for a monthly pass, and just like a phone expense, you had to prove medical need in order to get those funds. However, that is the past. ESIA recipients in HRM now receive an annual bus pass. The pass is called an X-Pass, it is not classified as a medical or special need, and it has the recipient’s picture and name on it. When the pass first came out last summer, some recipients reported being harassed and stigmatized over having the pass. Nonetheless, one can say that the annual pass is a great thing, especially for those who received no transportation expense previously. ESIA recipients in HRM now have more freedom to travel. This annual bus pass is not an improvement for all. Those who live in rural areas where there is no bus service receive 20 cents per kilometre of travel, in terms of travel expense. Here in the HRM, those who previously received the $78 monthly transportation expense are actually worse off due to the new annual pass. You see welfare recipients in Nova Scotia live 30 to 60% or more below the poverty line. Shelter rates range from $223 for a single person who is a boarder, to a maximum of $620 for a family of 3 or more. There is also a personal allowance of $275. I am a single person who boards. When I was receiving a $78 monthly transportation expense, I had the option of buying a sheet of bus tickets, and using the remaining $58 on food or another expense. When the new annual passes came out, everyone on ESIA in HRM lost their transportation expenses. I am down $78. “But what about the increases?” You might say. Well, after years and years of transformation, in Jan 2020 ESIA recipients will see an increase which will vary between $11 and $40 monthly. This increase will be bundled with the current shelter allowances and the current personal allowance, and will collectively form the re-titled “Standard Household Rate”. Even if I get the $40 increase, I am still worse off. There is paperwork put out by the department that indicates single disabled people will be ahead $83 a month due to this transformation. My colleagues and I reject this, for two reasons. First, the example includes the “historic” $20 increase to personal allowance in 2016. For reference, the ESIA rates were frozen for 3 years prior to that increase and have been frozen since. Secondly, the example includes the increases to the Poverty Reduction Credit, which is received quarterly by single Nova Scotians who have an income of less than $12,000. It’s unfair to include the PRC increase, as anyone living in such poverty would lack the ability to ration the quarterly payments over 3 months, as the example would indicate. As I’ve mentioned, I attended the “First Voices” consultation. We were given a handout, a roadmap to the new system. 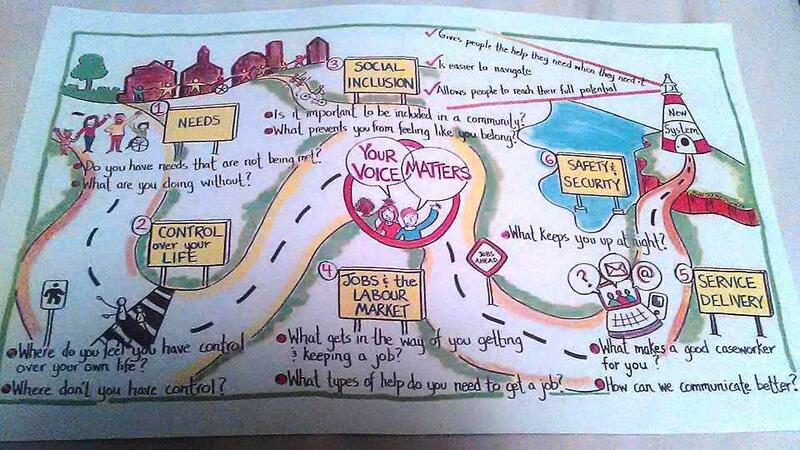 In the middle of that map, in big letters, are the words “Your Voice Matters”. But does my voice really matter? Are the people in power really listening? On one hand, there is some evidence that they are. I mean, at one time not long ago, if an ESIA recipient were in receipt of child support, the government would take 100% of that money from the recipient. That policy ended in August 2018, now recipients get to keep all of their child support, and I had a hand in ending that policy. 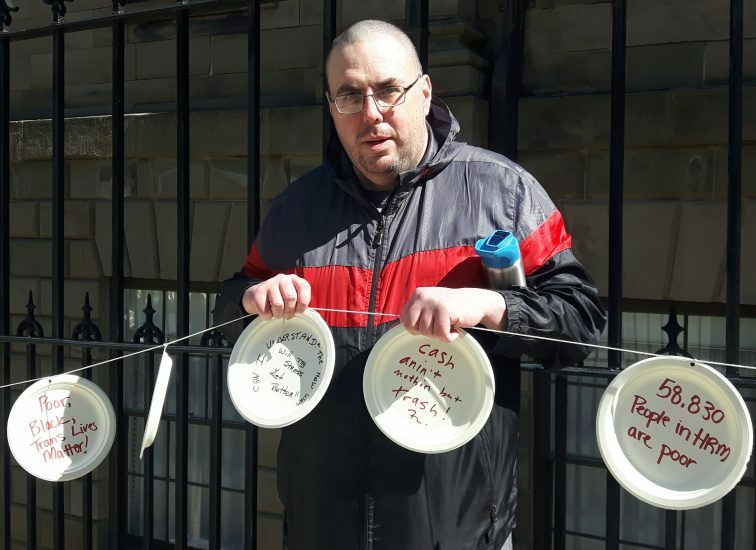 I wrote about that policy, I gave a speech outside the legislature calling for the end of the policy, and I went door to door with others with a petition in hand, listening to people’s stories of the punitive, unjust system. In 2016 at the First Voices consultation I attended, over half the group, including myself, had issues with one particular caseworker. People complained that he was rude, wouldn’t return calls, and made cuts to people’s benefits without giving a written reason why. In 2018, going door-to-door with the child support petition, I learned that the same caseworker is still employed and still making cuts to benefits and not providing reasons for the cuts in writing, being rude to recipients, despite being complained about. We have also been promised that, with this transformation, employees of the Department of Community Services would treat clients better. While many caseworkers are great, and caring, many recipients are still waiting for that better treatment to kick in. While the 100% Child Support Clawback has ended, other 100% clawbacks remain, namely the clawback on ESIA recipients who are self employed and the clawback on Employment Insurance monies. Will the Department of Community Services be ending these clawbacks? I hope so, but it remains to be seen. In addition to being a recipient and a member of BRAG, I am also a member of CASAAR (The Community Agenda for Social Assistance Adequacy and Reform). Both groups have requested to meet with both The DCS Minister and the Premier. Both groups were instead offered an opportunity to meet with the ESIA program executive director Brandon Grant. CASAAR declined the offer to meet with Mr Grant, and after two meetings with Mr Grant, BRAG followed suit. BRAG members feel that nothing was accomplished with our two meetings with Mr Grant, and further meetings would be pointless. In addition, when BRAG members wrote letters to the premier and DCS minister asking for an end to the EI and self employment clawbacks, we received a form letter response from Brandon Grant, outlining other transformations that have been made, including the end of the child support clawback. We are told that our voices matter, but how can we believe that when those in power refuse to meet with us? I ask this as a recipient, an advocate who is fighting for change, and a voter—Why are they not meeting with us? Check out the Benefits Reform Action Group on Facebook. Another clawback that nobody (and I mean NOBODY) talks about is recipients between the ages 60 to 65 having their CPP clawed back 100%. It is disgraceful that when a recipient turns 60 they are FORCED to apply for it and have it all taken away. Then when Community Services walks away when the recipients turn 65 they are stuck with a reduced amount for the rest of their lives. Please start including this shameful practice to any further actions. I did not know you could apply for CPP before age 65. Glad I read your comment. They are doing this because they don’t want to miss any opportunity to pass the buck to another department or level of government. The less the Nova Scotia Department of Community Services pays out to those on income assistance, the happier they are! They will do ANYTHING to avoid giving us money. I agree with both of you. My presentation was completed on short notice, and with only 10 minutes to speak. I tried to cover as much as I could, but could not get to everything. For instance, even those who get the $40 increase won’t be better off. Factoring in inflation, many MANY people are worse off than when the transformation started. I will be tweeting out some elaboration on my Twitter account. Twitter.com/OneManFaction. I would appreciate a follow, but it’s a public account, so you should be able to see my tweets regardless. “having basic needs” What a laugh. In my case, that would mean I they would have to increase my cheque by at least $500 a month just so I could eat a basic diet and have money for many things that would help my myriad of medical problems. And if I wasn’t getting a rent supplement, I would need at extra $405 for my rent. I doubt there are many who would rather have a free bus pass over $78. And it makes no difference to anyone who has no option but to use Access-A-Bus — a service that is utterly miserable to be forced to use and is about to get worse due to a major change that Metro Transit foolishly thinks will make it better. I only go out when I have to because I’m in such bad shape so the free bus pass is not making any difference in my life. What the bleep? “There is paperwork put out by the department that indicates single disabled people will be ahead $83 a month due to this transformation.” How does a forty-dollar increase magically turn into $83? And even if it was a whopping $83, that does not raise any of us even close to the poverty line, never mind above it. I don’t receive the Poverty Reduction Credit because the special needs amounts added onto my monthly cheque put me slightly above $1000. Most people who are on ESIA due to disability will be receiving special needs amounts so some of them are not going to get the PRC. The fact that DSC even thinks we ration out any quarterly payment over three months shows how utterly clueless they are about what it means to live in government mandated poverty. No one does that! Ridiculous. When we get those lump sum amounts, we buy something with it we normally couldn’t afford such as a pair of boots, clothing, an appliance, and a million other things we can’t afford on regular months. The DCS just loves to point out all these “extras” we’re getting, don’t they? As if they think we’re stupid enough to think this means they’re doing a great job helping us. You know they even consider the food bank a source of “income” for us. I can’t get to a food bank in a wheelchair without a major hassle and would only have a small amount to take home because it would have to fit in the bag on the back of my wheelchair, never mind that most of the food they have I can’t eat due to my dietary needs.